At first glance, the “log cabin” may seem like a luxurious house with logs stacked up to form the exterior wall, but in actuality they are ‘logs’ made of blue PVC that have been painted brown to merely look like they are made of wood. The PVC log house was built by Asst. Prof. Dr. Wachira Saengrasamee from RMUTT’s Faculty of Architecture and received the Outstanding Creative Achievement award from the Council of Deans of Architecture Schools of Thailand (CDAST). Its purpose is not to be a permanent residence, but to be a temporary home for disaster victims. Asst. Prof. Dr. Wachira Saengrasamee said that he designed the PVC log house using concepts from log cabin design, which consisted of logs stacked up to form the exterior wall. Furthermore, a log house may be built faster than a house made of masonry. Although fiber cement tiles may be quickly constructed, using this material poses problems in terms of durability. It is also difficult to disassemble and reassemble when relocated. Moreover, while, wood is rare, expensive, and heavy, making it impossible to use to construct temporary homes, Asst. Prof. Dr. Wachira Saengrasamee tried to find other materials that contained a variety of uses and can be used several times. Most importantly, the material should be lightweight, easy to transport and ship with minimal risks, and easy to install. Asst. Prof. Dr. Wachira Saengrasamee settled on using a three-inch PVC pipe, which technicians commonly use for drain sewage. PVC pipes are round, hollow, lightweight, tear-resistant, can be easily bought and transported, and contain a variety of uses. A three-inch PVC pipe was used as it is not too small nor too big. In addition, he used PVC pipes to construct a model temporary home with a width and length of 1.5 M each, respectively. The home can accommodate three people (e.g., father, mother, and child) and costs THB 60,000. It takes two people and half a day to construct the temporary home. The PVC log house has a width of 2.4 M and length of 3 M, respectively, and can accommodate up to 5 people. There is one bedroom, one bathroom. 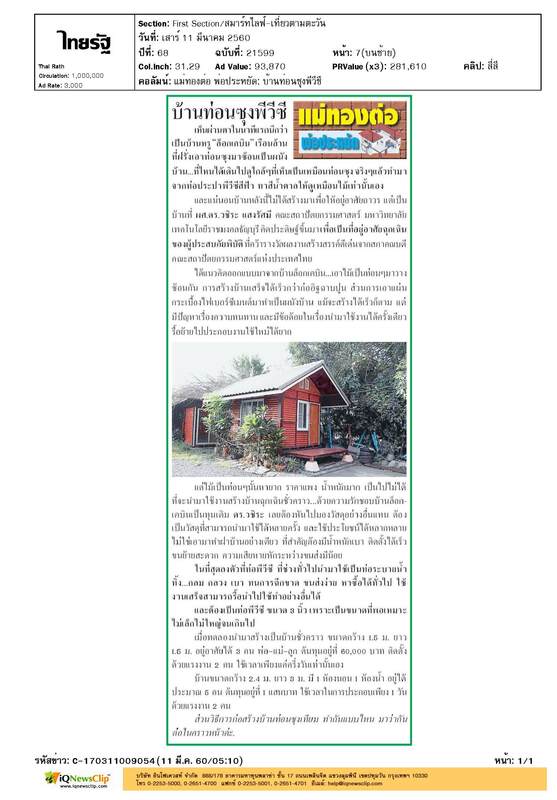 Furthermore, the log house costs THB 100,000 and can be constructed in merely one day. Stay tuned for our next article to see how to construct the PVC log house.